Last weekend we did our first N scale module exhibition. 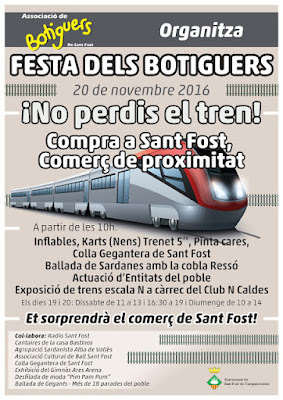 It was held in a small town called Sant Fost de Capcentelles, near Barcelona, by the shopkeepers association. This year they choose the slogan "Don't miss the train! 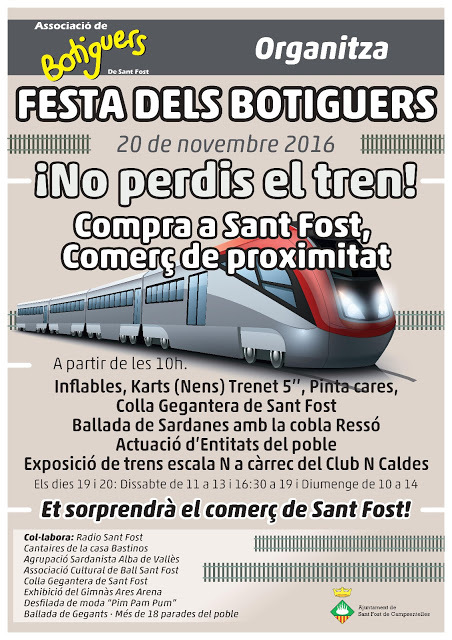 Buy in San Fost, local business". And they asked us to mount our modular layout during the whole weekend. We were lucky to have a 14 meters long room to mount the layout, as it is exactly the total length of our modules together as we still don't have any curve module. We only had time to make two loops and eight straight ones, and now we have to produce more headers to build more modules. We plan to build some curved ones and a big train station. The assembly and set up of the modules was pretty fast, it only took us 2 hours to have all them assembled and ready to run trains. 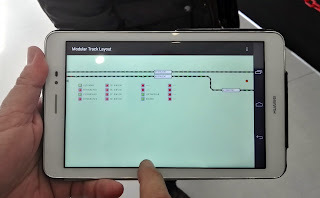 There was no problem in the track alignment between modules, and trains ran in a very smooth way between modules. That was the first time we were mounting all our modules together, so the system is proved to be reliable. The event was well attended and each of the members had also many visits from friends and familiars who never before had the chance to view the results of our hobby. During all this time I had my modules upside down, pending of decoration, and it was almost impossible to access the garage where I spent so many hours building them. The digital system has been proved also to be reliable and easy to manage. 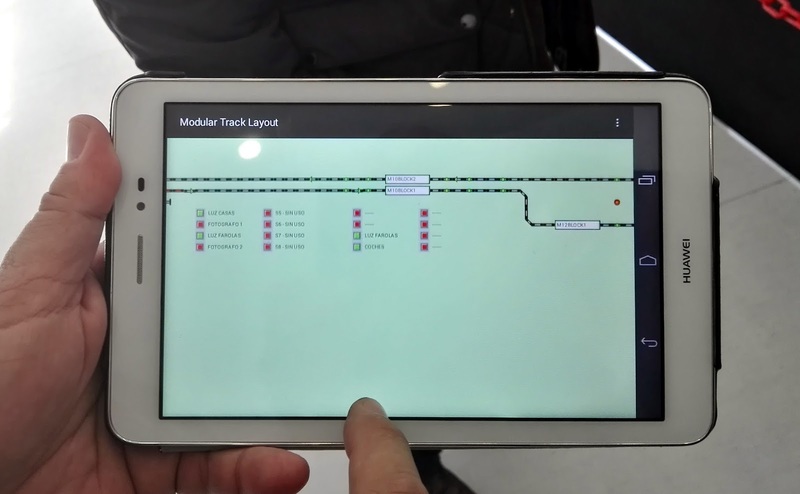 All of us were able to use our tablet or smartphone to manage trains, lights or accessories of the whole layout. 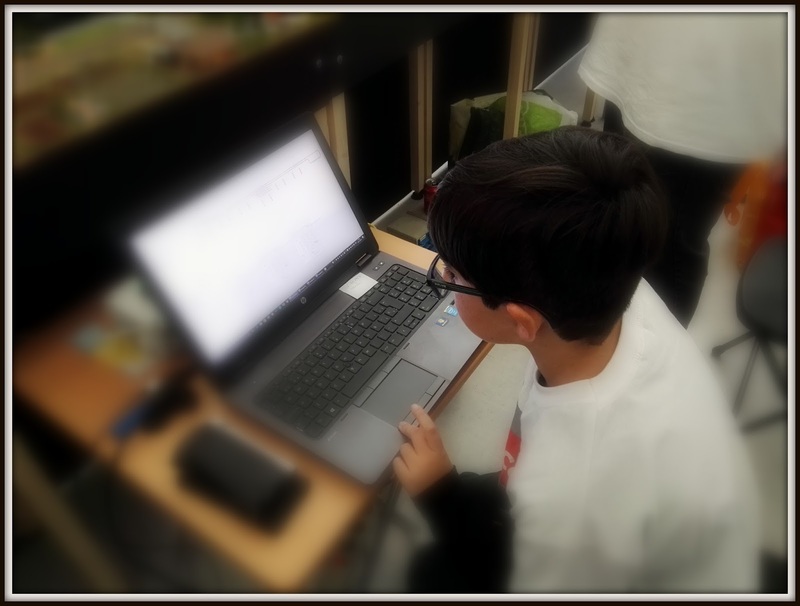 And even our youngest club member managed alone all the traffic with no problems. And everything built by us, only using Arduinos and Open Hardware and Open Software. We really spend a fantastic weekend, we are looking forward to organize a bigger train exhibition soon, with more modules for sure. We want to thank this opportunity we had to San Fost mayoress, the Shopkeepers Associacition, and specially to Juan, the most active member of the club who prepared the complete event. Congratulations to all the members of ClubNCaldes on the first exhibition of the club's layout. May it be the first of many !